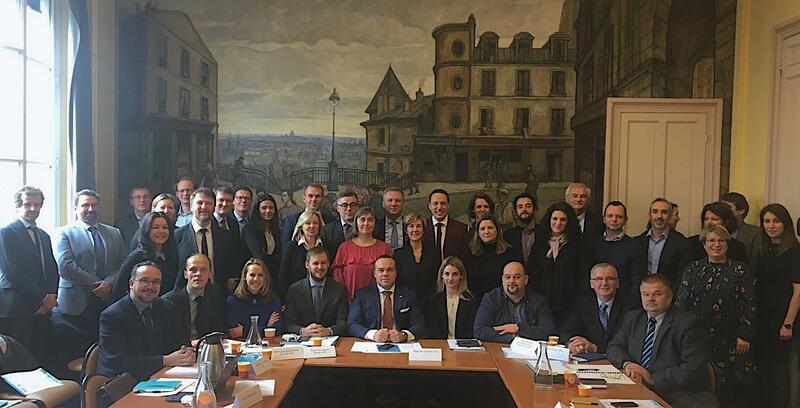 On 25 January 2019, the kick-off meeting of the Partnership for Security in Public Spaces took place in Paris, France. Nicolaas Beets, Dutch Special Urban Envoy, opened the meeting. He presented the process leading to the Pact of Amsterdam and the design of the Urban Agenda for the EU. Francesco Amodeo, Policy Officer at the European Commission’s Directorate-General for Regional and Urban Policy (DG REGIO), reflected on the main opportunities, challenges and objectives that the Partnership will envisage as part of its journey and stressed the unique added value of the Urban Agenda for the EU. As Partnership Coordinators, the City of Nice and the European Forum for Urban Security (EFUS) shared their expectations and ideas regarding the thematic orientation of the Partnership. Sébastien Viano, Director Europe and External Funding of the City of Nice, emphasised the need to work jointly at the EU level. EFUS Executive Director, Elizabeth Johnston, commented on the importance of public spaces as the identity and social fabric of cities. A roundtable of the Partnership members ensued discussing the motivations, main security challenges and expected outcomes. Some of the key themes for partners were prevention, technology, better guidelines and laws, and exchange of practices. All present European Commission Directorates-General, DG Migration and Home Affairs, DG Employment, Social Affairs & Inclusion, the Joint Research Center (JRC), DG Research and Innovation, and DG REGIO, presented their activities relevant to the Partnership. The Secretariat (Ecorys) provided an overview of the Partnership functioning and its phases. This included the determination of the scope and development of a road map moving forward through an Orientation Paper, Action Plan, and Actions implementation. Lastly, the City of Madrid submitted to the Partnership its candidature to be Co-coordinator together with the City of Nice and EFUS, which was unanimously supported. The meeting was brought to a close with the determination that the next Partnership meeting will be hosted around May 2019 in Nice. More information on this Partnership will become available as the Partnership work unfolds. In the meantime, please consult the full list of members here. Read an initial list of key events on the topic of security in public spaces here. If you have any questions, please contact ua-security@ecorys.com.